Oregon Trail Electric Cooperative Director Gary Miller with the new van he drives for the veterans of Grant County. Miller was one of the major sponsors at the Oregon State Elks Association that bought the van. Oregon Trail Electric Cooperative Director Gary Miller retired from his job as a telephone executive in 2006 after a distinguished 34year career. He may need to go back to work to get a little rest. Miller, a lifelong John Day resident, has not been content to put up his feet after retiring from the Oregon Telephone Corp. In addition to serving on the board for one of the largest electric cooperatives in Oregon, he is an active member of the Elks, both locally and in the state. That process started early in Miller’s life with a timeless childhood job—a paper route—that introduced him to nearly everyone in town. The day after getting his degree at Eastern Oregon University in La Grande, Miller started as an installer for the phone company. He eventually rose to the top position with the company, but Miller never forgot where he started. “I had one job my whole life,” he says. These days, Miller is involved in a number of activities, including helping with scholarships for local students through the Stuart Foundation. “One of my favorite days of the year is when they hand out the scholarships,” he says. 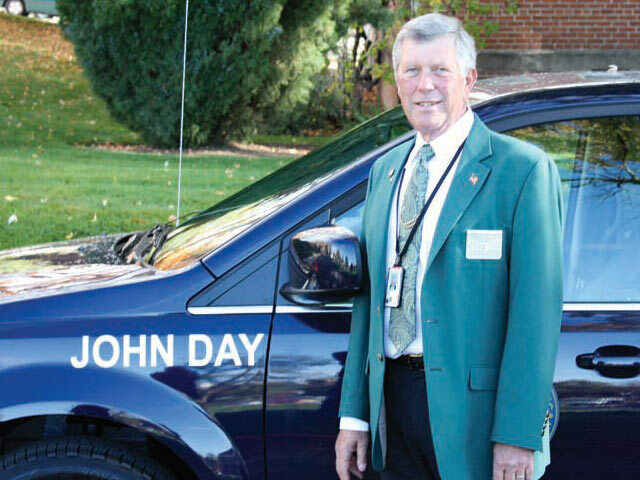 He also can be found a few times a month on the lonely road between John Day and Boise, Idaho, shuttling veterans to a Veterans Administration hospital. It is a 400 mile road trip—and fraught with peril in the winter—but Miller is an enthusiastic driver, passing the time listening to stories of the heroes who served their country from World War II to the most recent conflicts in Iraq and Afghanistan. “Giving back is important.” Giving back, it seems, is his one job now. Lane Electric director Ingrid Kessler is active in her community—and not just with the 10,000 cases her animal hospital sees each year. If Ingrid Kessler had not volunteered at an animal shelter near Stanford University’s campus, she would most likely be a philosophy professor at an elite university. After all, she was doing graduate work in the classics at one of the country’s most prestigious schools, preparing for a life of academia. But the animals at the local Humane Society took her career in an unexpected direction. Trading Socrates for a stethoscope, Kessler earned her doctorate of veterinary medicine from Michigan State University. She eventually moved to Eugene where she worked at an emergency veterinary hospital. Ten years ago, Kessler helped buy the hospital. Her active outreach into the community brought her into the orbit of leaders of Lane Electric Cooperative. “I found we were at the same events, caring about the same community things,” she says. All 10,000 of them. That is the number of cases Kessler’s veterinary operation serves each year, offering the most advanced medical technology available. 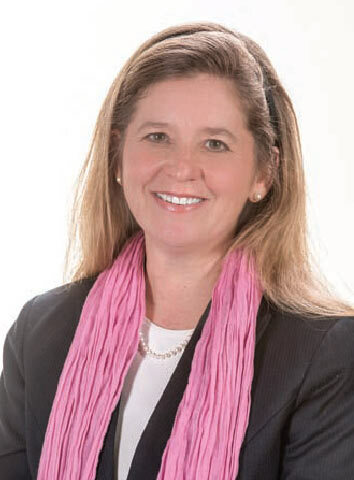 She also has taken this passion for society’s most vulnerable to other endeavors, serving as president of the board of Kids FIRST, a nonprofit organization that provides a multidisciplinary team approach to child abuse investigations. “We’re there to help children when they need us most,” Kessler says. Philosophy students may have missed out on an engaging professor, but the citizens of Lane Country are glad Kessler found her true calling. Blachly-Lane Electric Cooperative Director Cliff Kelley has followed in his son’s footsteps—on horseback— in cowboy mounted shooting competitions. “That looks like fun.” That was Cliff Kelley’s reaction years ago after watching his son Dan participate in a cowboy mounted shooting competition. The sport, one of the fastest growing equestrian activities in the nation, involves riding a horse and shooting a single action revolver at target balloons in an arena. Five years ago, the senior Kelley thought the sport looked so fun that he entered a competition. Now, the Blachly Lane Electric Cooperative director is an active member of the circuit, with gunslinging abilities that have qualified him for the world championships. Kelley’s avocation is a far different activity than his former professional career as an information technology specialist, much of it working for not for profit healthcare systems. “Cowboy mounted shooting is a mental game, much like golf,” Kelley says. But instead of agonizing over a 6foot putt, the participants ride at breakneck speed through a challenging course firing a single action revolver or, in some cases, a shotgun. The competition is based on time and accuracy. Kelley found early success. 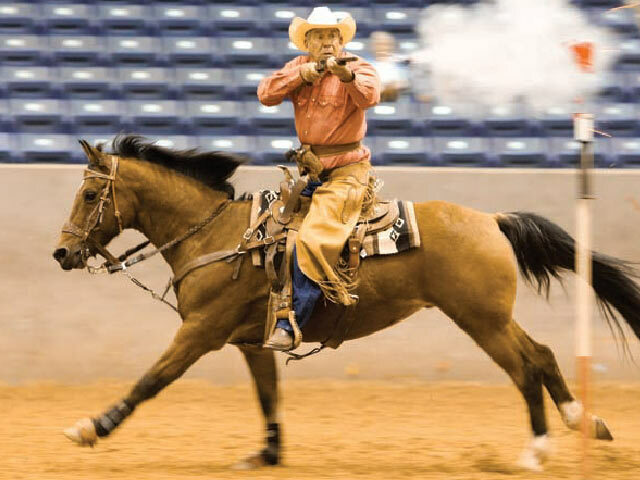 He qualified for his class in the 2014 world championships in Amarillo, Texas, which pits the world’s best mounted shooters against each other in a four day event. Like golf, the sport is one of inches. Kelley narrowly missed two balloons, keeping him out of the finals. Kelley also discovered that life is sometimes a game of near misses—and hits. On his trip home from Amarillo, Kelley’s vehicle was struck at high speed by a piece of oil field equipment that had broken free from a truck. The impact was almost cataclysmic, and Kelley narrowly survived. He spent six weeks in a New Mexico hospital and still feels the effects of the crash. But he is back in the saddle, out on the circuit and on the heels of his son, who is a world record holder in the sport. “It’s good people and good competition,” Kelly says. It also helps to be quick on the draw.